Happy May Day! Spring is finally here with its flowers, its (supposedly) sweat weather and with all that, the anniversary of some major events too. We can particularly think of May ’68 and its protests which took place fifty years ago. To celebrate this anniversary, we have organized an event on 4th May, at Balham Bowls Club, with three important activists: Matt Myers, Malia Bouattia and Koshka Duff. 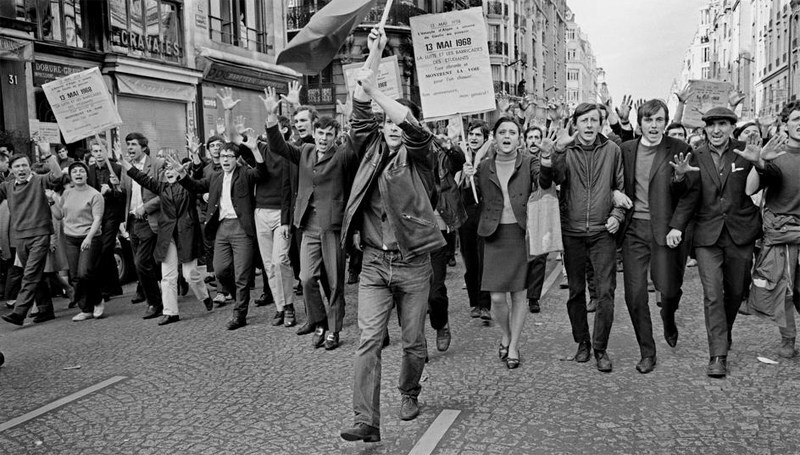 May ’68 was a huge step in French, and European, history, and it left an important legacy behind. But what exactly was May ’68, and what is its legacy? It all began when a group of young people were arrested while protesting against the Vietnam War in Nanterre. An anarchist group was created by D. Cohn-Bendit to protest against these arrests; afterwards, the University of Nanterre was closed because of the following troubles. But the movement spread through France, to Paris (especially the Quartier Latin) where the violence was extreme (barricades, Molotov cocktails, CRS, evacuation, burned cars, broken windows, hundreds of wounded people…). 600 people were arrested and several hundred were wounded, turning public opinion to the side of the protestors, so they were soon joined by the Trade Unions and the organised working class. 800,000 strikers protested against De Gaulle, the consumer society and unemployment. It created an important political crisis and finally the workers achieved better rights, although students were not rewarded for their fight. May ’68 is remembered as the major first student protest and has left an important legacy, which will be the principal subject of the discussion on 4th May. The three activists we will hear from are going to talk about the evolution of student protests over the past decades. Matt Myers is the author of “Student Revolt: Voices of the Austerity Generation”. He is an History student and is currently doing research on ‘changing conceptions of the working class on the British, French and Italian left during the 70s’; he’s an expert on our subject. Malia Bouattia was the former President of the National Union, so she was very often involved in protests and student rights. Finally, our last guest, Koshka Duff is a PhD student at the University of Sussex and is an involved activist. The debate promises to be fascinating. This event may be of a great interest for you, especially if you are interest in history, student rights and current events. We hope to see you at Balham Bowls Club at 7pm for this amazing event! This blog post is written by our wonderful new intern Laurenna Le Tarnec. You can follow Laurenna’s adventures on her blog by clicking here.